Now for sale on the sought after East Side of Carolina Ave on Venetian Isles. 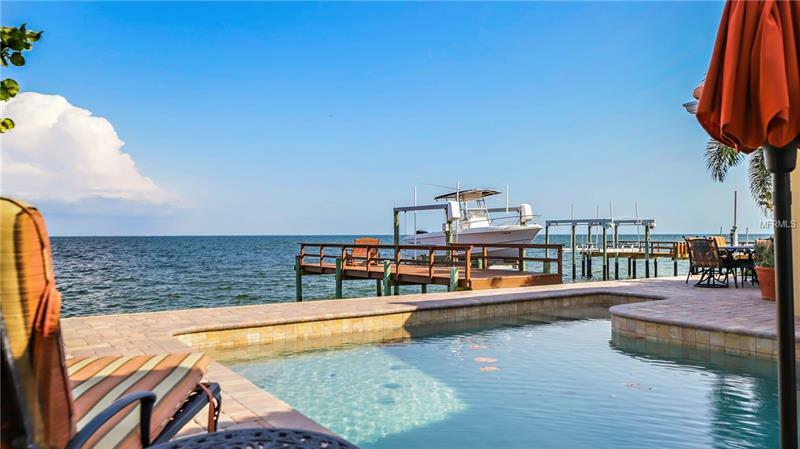 This stand out 4 bed 3 bath home plus bonus room sits proudly on Tampa Bay waterfront. The home is nothing short of spectacular from the new circular driveway to the large foyer and on to the expansive water views the minute you enter the open plan living area. With split bedrooms offering privacy for family and guests. The master suite has a huge walk-in closet and bathroom with windows to the world a Jacuzzi tub enormous tiled walk in shower and double vanities plus a single sit down makeup station. Three bedrooms on opposite side of the home all come with skylights one with walk in closet one with alcove and desk and one with built in shelving. Each bathroom is tiled and has granite one offering access to the rear of the house and dock. Open kitchen with all new SS appliances and GAS cooking plus an island! Granite counters and storage in abundance. A breakfast nook with window seat for the morning newspaper and coffee. Stunning Views of the Tampa bay are embraced from living area master bedroom kitchen and bonus room. In ground pool and ample outdoor entertaining areas with hidden BBQ and bathroom access to the side. The home has a recently renewed dock and deck and boat lift with electric and water to 11000lb. This home has just about everything - come see it today!